At last, a portable music centre that a monkey could set up, with a wealth of connectivity options, and an amazing frequency range from its small speakers. WRITING REVIEWS CAN be a complex mission, especially when products need to be dragged through set up phases, babied over lengthy run-in processes and then carefully matched with partnering equipment to distil their essence into a page or two of copy. Then there are the products that make reviewing a simple task. This has to be one of the easiest reviews I’ve ever written, which already tells you a lot about the product. Cambridge Audio’s (CA) products have impressed me since I first started lurking around the fringes of the AV game back in 2006. I’ve yet to give a piece of CA equipment anything less than a good review, many have been glowing, and a few have been borderline rapturous. 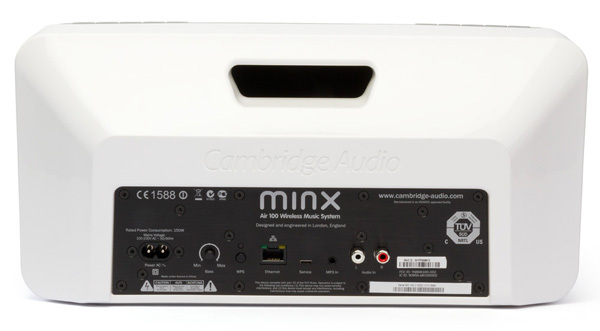 The new Minx Air range of wireless music systems is the UK based company’s first shot at this increasingly lucrative side of the market, and with increasing interest in this type of speaker, a review was arranged at the first possible opportunity. The 100 looks restrained and quite sleek in its gloss white, silver and grey styling that’s bereft of the blingy accents that might be found on other brands. That said, without the flash bits, that front panel is basically nothing more than an expanse of grey, and it’ll definitely be seen as boring or uninspired by some. The 100’s housing is solidly constructed, and while it’s not resonance free when thumped, it’s devoid of flex or wobble. It’s also heavier than expected – while 4.1kg doesn’t sound like much, the 100 is a surprisingly hefty chunk to lug around. It’s not a battery-powered portable, so the weight isn’t a hassle, but it does bode well for the quality of the internals. The housing is acoustically damped to reduce vibration and it features a bass port integrated into the rear carry handle. 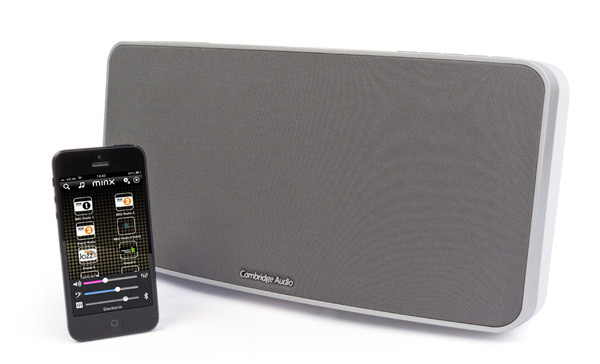 CA has covered the various connectivity options by making the 100 to support Apple’s AirPlay standard as well as apt-x Bluetooth. So the 100 will talk to Wi-Fi networks as well as being happy with any Bluetooth enabled phone, media player, tablet or computer. The Ethernet socket round back means that the 100 can also be hooked up to a wired network if the user so chooses. There are rear mounted 3.5mm and RCA inputs to extend the overall connectivity choices. On-board controls are limited to five illuminated buttons on the top right (power, Bluetooth pairing, volume up, volume down, and analogue source select) and five similar buttons on the left, which operate five of the 10 pre-programed internet radio stations – the other five are accessed by the full function remote control, which in this case was supplied sans battery. There’s also a downloadable free Minx app that offers additional control options such as EQ settings and bass levels, as well as giving access to over 20,000 internet radio stations, allowing them to be selected and stored on the preset buttons on the Minx Air 100 or the remote control. Unlike many similar devices, the Wi-Fi setup process couldn’t be much easier despite the unit’s lack of a display – plug it in, fire it up, press a button on the back, type a web address into the web browser of a nearby phone, tablet or computer (I used my iPhone), choose the Minx Air 100 option and you’re up and running in about a minute. Even my hidden wireless network proved no hassle at all for the Minx Air’s setup routine. Bluetooth setup is even easier: push the pair button on the unit, pair your phone and you’re ready to push play in less than 30 seconds. It’s worth getting right into the sound quality part of the review, because it ties strongly into the 100’s design. Minutes after unboxing the unit, I had music streaming from my phone. My first thought was that the 100 had a sweet pair of tweeters delivering an extended and smooth top end. Imagine my shock upon checking out the specifications online to find that what I imagined to be a small cone driver plus tweeter configuration is actually two 100mm Balanced Mode Radiator (BMR) drivers. BMR drivers are a strange hybrid between conventional cones and flat panel drivers – they combine pistonic and vibrational modes in a single drive unit. This allows for wider dispersion and a wider frequency range than cone drivers. The other obvious characteristics of the 100 were that it punched really hard, was capable of high volume levels and had oodles of hard-hitting low bass. This really didn’t sound like the expected 20 watts or so of power. Instead, the 100 packs 100 watts of Class D power backed up by digital signal processing, which is total overkill for a unit this small. But it works well. Make that “works exceedingly well”. For a speaker system of this size, the 100 sounds great, open and detailed with a cohesiveness that stretches from the top of the treble to the bottom of its commendably deep low end. One of the major strengths on display here is that low end – there are manufacturers who need to get one of these units, pass it to their design team and tell them to “make our bass sound like this”. The 100’s bass can be adjusted via a small dial on the rear panel or even from the remote control and the app, but it’s easy to find the right setting and just leave it there because the bass quality is so good. There’s a real bite to bass guitars and drums have substantial impact but there’s no boom at all. It’s a real treat to listen to the 100 with the wick turned up and oddly enough, the BMR drivers have a weird side effect: they don’t excite the surface the 100 is sitting on. Perhaps this is a combination of the driver technology and the 100’s non-resonant housing, but on my bedside drawers, there’s not a murmur of reverberation. This is amazing considering how badly every other small speaker system I’ve reviewed behaves in that location – some of them turn the drawer into an awful bass resonator, but not this system. This means that the 100 basically took up residence two feet from my head and lived there for much of the review. At that distance, it’s in the near-field range with all the potential negatives right up close and personal, but beyond a mild hiss when the music isn’t playing, no major negatives were observed. The 100 even goes out of its way to be suitable in this very local environment, because it displays excellent dynamics and good levels of detail at low volume levels. In outright terms, the 100’s overall character is quite dry, lacking some of the warmth that’s appreciated when needed to tone down the brightness or leanness of bad recordings. This is particularly noticeable when the unit is connected to a good CD player via the RCA line inputs, but I’m getting to nit-picking levels. Considering the price point, there’s a lot going for this system. CA’s Minx Air 100 reminds me of B&W’s Zeppelin Mini, especially in terms of its clarity and punch. The Zep was more extended at the top and a tad clearer (as far as my fragile memory can recall) and punched just as hard with more force down at the very bottom. With B&W’s gorgeous new Lightning dock equipped Z2 model priced at $699, and likely to sound much like the old Zep Mini, it’d be strong competition for the 100, but then again, the CA unit has more connectivity options, including the almost obligatory Bluetooth. The remote normally comes with the battery, sorry that this one got lost. It has been in and out of the box quite a few times and must have been dropped somewhere in the process – my apologies. All new boxed units come with the remote battery. Just got me the Minx Air 200 – it utterly rocks. Looking forward to your review.